Couscous Week with the city’s finest restaurants. This year we have been invited to participate in the international couscous competition happening in Sicily later this month. To celebrate all things couscous we are launching the first ever NY couscous week. During September 5-12 we are collaborating with some of NY’s favorite spots; from a Michelin star restaurant to neighborhood favorites, from Brooklyn to Manhattan, chefs were asked to show creativity and use New York Shuk hand rolled couscous to create a unique take of their own. Daniel- Chef Jean Francois Bruel will make a warm squab salad with our corn couscous. Lightly smoked breast, sweet corn, stuffed legs, and bok choy. Roman’s - Chef Michael Mangieriat will make a traditional Sicilian seafood couscous. 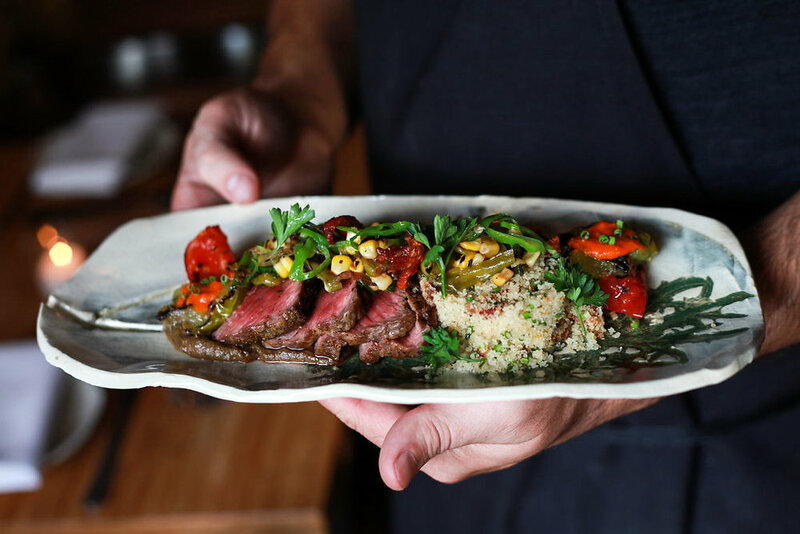 Shalom Japan - Chef Aaron Israel is making A NY strip steak rubbed with spices intended to evoke kebab flavors, served with couscous, grilled heirloom tomatoes, harissa, grilled onion puree, and a summer vegetable relish. Boulud Sud- Chef Travis Swikard will be serving couscous alongside a chicken tagine. Baccarat Hotel The team of chefs at Baccarat Hotel will be serving couscous with Maine Lobster Salad, cauliflower, walnut and maple caviar vinaigrette. As part of the couscous week program, New York Shuk will be teaching two cooking classes focused on The Art of Couscous. Learn all about the techniques behind making couscous from scratch. For those who won’t be able to attend the classes, Ron will demonstrate live how to make couscous on 'Instagram stories'. Sharing the tricks of making couscous at home without a steamer or a sieve. Follow us on Instagram. For us couscous is a symbol of culinary craftsmanship. A labor-intensive process of Semolina and water that’s rolled together to form tiny granules of couscous. Unfortunately, the art of couscous making was lost to the processed instant couscous. Our goal at New York Shuk is to keep the tradition alive and give you the opportunity to experience those lost artistry rituals. Learn more about New York Shuk Couscous, HERE. By hosting New York's first Couscous week we are hoping to give you a chance to experience couscous as it should be, made by hand not from a box.